Satisficing helps to explain why it’s tough to unseat incumbents in elections (I wrote about this in 2001, in a piece on Boston Mayor Tom Menino’s staying power), and why stale TV series retain big audiences while newer shows perish from inattention. It also explains why some of the suggested reforms meant to make Congress less partisan are unlikely to work, but more on that later. For all but a few of us, the rational actor model — or the economic theory that we look at all possible options and choose the one that brings the most benefit for the least cost — is a silly abstraction that we don’t have time for. This is why I’m suspicious of some free-market approaches to public policy, such as the idea of giving vouchers to parents and letting them figure out the “best” school among dozens of choices. It’s why the freedom to “choose your doctor” usually amounts to wanting the doctor that your neighbor raves about, or someone you saw featured on the evening news. Now we have Yelp and other consumer-review sites to help us choose dentists, mechanics, hotels, etc., but these are shortcuts to narrow our choices, freeing us from listing the pros and cons of a hundred possibilities. Political reporters hate the idea of satisficing because it reduces the range of plausible outcomes in American politics. Satisficing means that third parties and independent candidates rarely attract many votes, and challenges to incumbents in party primaries almost never succeed (yes, even if a former vice president’s daughter is the challenger). 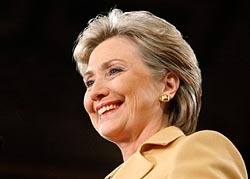 It could also be bad news for reporters covering the 2016 race for the Democratic presidential nomination, assuming that de facto incumbent Hillary Clinton runs. Given Clinton’s cautious centrism on financial regulation, a serious challenge from the left makes theoretical sense (and led to a media boomlet for Elizabeth Warren as a possible rival). In presidential primaries, we’ve seen the same pattern many times. There’s an establishment candidate the base doesn’t trust, and they have to spend a bunch of time assuring voters that they’re on the side of the ideological angels. Some of these efforts are strained, or even embarrassing (see Romney, Mitt). But eventually, they almost always succeed. The Tea Party movement has also had some success in getting past the satisficing impulse, at least in non-presidential races. Thanks to intense media coverage (especially at friendly outlets like Fox News), lavish funding by organizations such as David Koch’s Americans for Prosperity, and a focal point for members’ anger (the Obama presidency in general and Obamacare in particular), the Tea Party was able to become the satisficing option for many Republican primary voters. Tea Party candidates became synonymous with “the most conservative option,” and many voters didn’t have to look any further, even in a GOP primary with a non-Tea-Party incumbent. But as Waldman notes, the Tea Party never coalesced around a credible alternative to Romney in 2012, who was good enough for most primary voters. On the Democratic side, Al Gore in 2000 and John Kerry in 2004 won Iowa and New Hampshire, and any opposition quickly melted away. They were good enough for voters not to look any further, and so far there’s no reason to believe Hillary Clinton won’t have the same advantage in 2016. As noted above, the satisficing principle is a tough obstacle for third parties and centrist movements like No Labels (discussed here). Their support depends on utter revulsion with both major parties and their ideologies, and not many voters actually fall into that category. This Sunday the Boston Globe concluded its well-reported series “Broken City” with a think piece on possible ways to “break the logjam” in Washington, and there is a fair amount of party-bashing here. Those on the lookout for what James Fallows calls false equivalence journalism will wince at the description of “a permanent drift toward inaction driven by increasing partisanship in both parties.” As the party committed to less government action, the GOP has been more responsible for gridlock, and it’s proud of it. (Unbiased coverage could instead point out that the Republicans have every right to use the filibuster, threats not to raise the federal debt ceiling, and any parliamentary tool at their disposal.) The Globe piece also seems to conflate partisanship with extremism; the passage of Obamacare was certainly partisan in that it got no Republican votes, but that doesn’t mean it was an extremist bill. Still, Globe reporter Michael Kranish and his colleagues have a good round-up of possible reforms, including Matt Viser’s look at nonpartisan primaries (which I wrote about a few weeks ago). Satisficing is never mentioned, but I think it explains a lot about voting records in Congress. Naturally, voting with one’s party leadership is the first option considered by a member of Congress, and there’s a rarely a good reason to look past it, which means tinkering with the way we elect people isn’t necessarily going to change much in Washington. But through much of the 20th century, there was a counterbalance to partisanship. Democrats from Southern and rural districts, and Republicans from Northeastern and urban districts, represented constituencies at odds with their respective party’s national leadership. For these members of Congress — think of Ben Nelson in Nebraska or Olympia Snowe in Maine — independence from their party’s leadership was so essential that crossing party lines was often the satisficing option. There aren’t many people in Congress left who have constituencies that don’t align with their party’s ideology. Without them, all the “civility” in the world won’t break the logjam in Washington. Perhaps there is a way to push more centrists, mavericks, or whatever you want to call them into Congress. Require each major party to deposit with the FEC, say, $100,000 for every congressional district in America. They get the deposits back only for candidates who receive at least 30 percent of the vote. That way, there will be an incentive to run candidates who fit their districts, and we may again end up with some representatives whose satisficing option isn’t always to vote the party line. What utter garbage!! Mr. Sullivan is a shill for the nanny state and a form of elitism that must determine what we, the unwashed, should have and don't know better. Yes the individual cannot look at all possible options but they sure know when one thing is better than another if they are given enough information and feed back. It has worked well to build the United States into the most economically successful country in the history of the world. The elites tried Mr. Sullivan's way in a lot of other places in this world in the last 1000 years and all ended up in oppression. The only thing that ever succeeds for the benefit of the many is the free market. But for elitists such as Mr. Sullivan, this is anathema. It is embarrassing that America lets him write his drivel here. There is nothing unconventional about his musings, they are all conventional paternalisms.